Current owner/occupants are interested in raising the existing building to make room for a new hall construction. The impetus for this decision is ADA accessibility deficiencies and limitations in existing building. Herbert Fritz (1915-1998) Born in Sioux City, Iowa. Fritz spent 1933 studying architecture at the Art Institute of Chicago and the University of Wisconsin-Madison in 1934. From1936 to 1937, Fritz worked for William Kaeser, who was a student of Eliel Sarinen at Cranbrook in Michigan. Afterwards, Fritz applied for a 1937 Fellowship under Wright at Taliesin and remained at Taliesin until 1941when he purchased 130 acres of rental farm property. This purchase was made after receiving encouragement from Wright to purchase a farm. Fritz stated that “he was always enthusiastic about anything Mr.Wright said” After his tenants broke their agreement, Fritz decided to move to the farm and resign from Taliesin. Fritz designed small buildings and farmed until 1947. After Fritz quit farming his wife opened a summer camp for girls on the farm site. The Golden Valley Kingdom Hall remains the home of the Golden Valley congregation. The building is also used by a Plymouth congregation and a Russian-speaking congregation. The three groups maintain an active meeting schedule. The exterior cladding consists of large rust colored wood framed windows that divide the light vertically on the Southern elevation, this arrangement accentuates the asymmetric form for the Hall. Narrow horizontal gray split-stone blocks of random size contrast the verticality of the glazing and two broad split stone chimneys mark the southeast and the northwest points of the plan. The southern building entrance door is found within the vertical window arrangement and is created with a double wood framed glass doors painted rust to match other windows. The East elevation of the Hall is set within a grassy, tree filled, berm that originates at a retaining wall near the entrance on the South elevation. This East elevation has a group of five vertically divided windows that punctuate the Easternmost point of the building. State of Significance by Summit Envirosolutions, Inc in 2012:“The Kingdom Hall of the Golden Valley Congregation of Jehovah’s Witnesses embodies the distinctive characteristics of a type, period, or method of construction; and it represents the work of a master. The building displays the plan, forms, and design features of Usonian architecture as developed by Frank Lloyd Wright and carried out by him and his students. It has an asymmetric plan, is set into the sloping site which allows for a multilevel interior, has a low-pitched roof with broad overhanging eaves including a prow-like form, and makes use of local materials such as the split-stone facing. 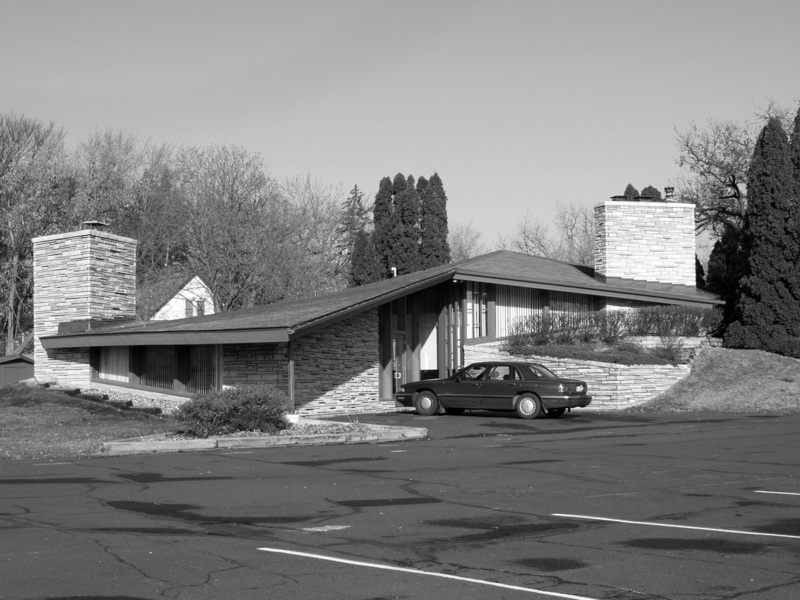 The building represents the work of a skilled architect, Herbert Fritz, Jr., who studied with Frank Lloyd Wright, learned the precepts of his approach to architecture, and went on to a long and successful career as an organic architect who created harmonious living and working environments that related to their natural surroundings (Dowling 1997: 11 ). Like his mentor, Fritz had a large group of loyal clients who remained devoted to his buildings. Fritz’s work has only been studied since the mid-1990s, and it is being increasingly appreciated as his buildings achieve the half-century mark. Religious buildings are a relatively small part of his work, and the Golden Valley Kingdom Hall is one of the finest. [i] Phase I and II Architecture-History Survey Douglas Drive (CSAH 102) Reconstruction Summit Envirosolutions, Inc.: 94). [ii] Phase I and II Architecture-History Survey Douglas Drive (CSAH 102) Reconstruction Summit Envirosolutions, Inc.: 94). [iii] Phase I and II Architecture-History Survey Douglas Drive (CSAH 102) Reconstruction Summit Envirosolutions, Inc.: 94). [iv] Phase I and II Architecture-History Survey Douglas Drive (CSAH 102) Reconstruction Summit Envirosolutions, Inc.: 94). [v] Phase I and II Architecture-History Survey Douglas Drive (CSAH 102) Reconstruction Summit Envirosolutions, Inc.: 94). [vi] Phase I and II Architecture-History Survey Douglas Drive (CSAH 102) Reconstruction Summit Envirosolutions, Inc.: 94). [vii] Phase I and II Architecture-History Survey Douglas Drive (CSAH 102) Reconstruction Summit Envirosolutions, Inc.: 94).